CreditDonkey consumer rights survey reveals a surprising number of consumers not knowing their rights. Becoming an informed consumer is the first step toward taking control of your financial life. 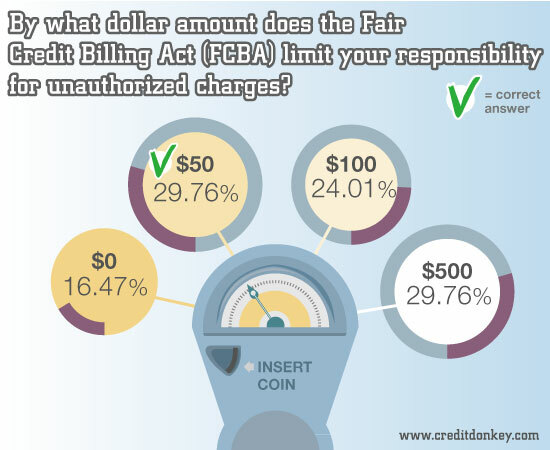 A surprising 7 out of 10 respondents do not know the Fair Credit Billing Act (FCBA) limits their responsibility for unauthorized charges to a credit card to only $50. Nearly a quarter believe the limit is $100. Another 3 in 10 believe it’s $500. Read our infographic on how to dispute credit card charges for tips on what to do the next time you see unauthorized charges on your credit card statement. More than 4 in 10 consumers incorrectly believe credit card issuers can increase interest rates after the first 6 months. Nearly 1 in 10 believes issuers can never increase interest rates. 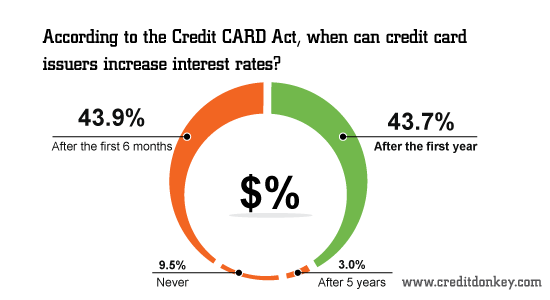 In general, thanks to the Credit CARD ACT of 2009, credit card companies cannot increase your rate for the first 12 months after you open an account. If your card has a variable interest rate tied to an index, your rate can go up whenever the index goes up. Most cards on the market have variable interest rates tied to the U.S. Prime Rate (aka WSJ Prime Rate). If there is an introductory rate, it must be in place for at least 6 months; after that your rate can revert to the regular rate the issuer disclosed when you got the card. 1 in 6 consumers believe credit card issuers can raise rates on an existing balance "any time the issuer feels like raising it." Remember, you have rights. While applying for too much credit may impact your credit score, credit card issuers cannot raise your interest rate on your existing balance simply because you have applied for too much credit or any time they feel like it. Thanks to the Credit CARD Act, increased rates can apply only to new charges. To be sure, there are some exceptions such as if you have a variable interest rate, you make a late payment, or when a promotional rate (such as an introductory rate) period ends. Another surprising finding: 55% of respondents think they have only 30 or 45 days to get a dispute letter in front of a creditor to take advantage of the federal consumer protection law. 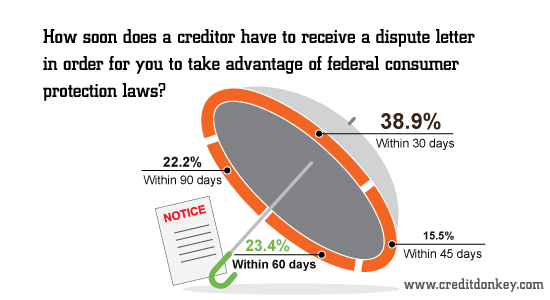 In fact, as 23% indicated, a creditor has to receive the dispute letter within 60 days, before the consumer can take advantage of FCBA's consumer protections. 22% of respondents think they have as long as 90 days. While the creditor must resolve the dispute within two billing cycles and take no longer than 90 days, consumers have to make sure the creditor receives the dispute letter within 60 days after the first bill containing the error was mailed to them. 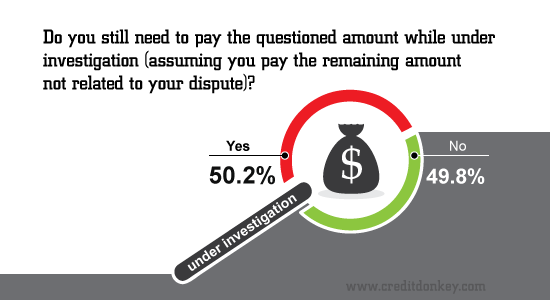 Half of respondents indicated they still need to pay the questioned amount while a dispute is under investigation. In fact, you may withhold payment on the amount. But you must pay any part of the bill not in question, including finance charges on the undisputed amount. To be sure, the disputed amount may still be applied against your credit limit. The survey results were eye-opening for our team. Consumers can have a healthy financial life only if they are informed and know their rights. Yet a sizeable number of Americans are unaware of their rights and responsibilities. We will continue our mission to help Americans make informed credit decisions. 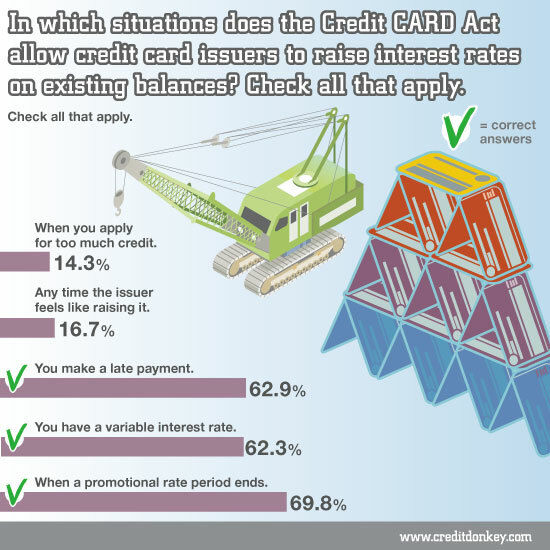 The Fine Print: In early July 2012, CreditDonkey conducted the survey of 504 Americans using multiple-choice questions on common credit card concerns. This is part two of two from our survey. For part one, please read the findings from Credit Card Debt in America. If you see a questionable charge on your credit card bill, it's important to act fast. Learn what you can dispute and the process of filing a dispute. Share on Facebook "Survey: Credit Card Rights"